Before I started my photography business, I used to take photos for myself. The images I made were not meant to impress anyone, and not meant to make anyone look thinner or taller or have nicer skin. My images were for me to tell a story--my story. When I clicked that shutter, my sole purpose was to capture the feeling of that moment so 10 years later I could feel that exact same feeling just by looking at that image. Now I have come full circle in my photographic journey. A husband, 2 kids, and a home later, I now realize how crucial it is to photographically document life as it is regardless how exciting or mundane. Because years into the future, I want to remember the details: that no matter how much I brushed my daughter's hair she always had what looked like a birds nest in the back of her head; that my younger daughter would stare at her big sister like a god since the day we brought her home from the hospital. I want my daughters to see that no matter how late their father worked, he always put the house back in its place just so they could tear it all up again the next morning. And in the far future, I want my grandchildren to see images of their grandmother and moms dancing in the living room in their PJs. Most importantly, I want these images to include everyone I love, not leaving anyone to be stuck behind the camera. From the moment your kids open their sleep dust eyes up until they're all piled in your king sized bed reading Good Night Moon for the 5th time, I am there to ultimately show you just how much you love each other by documenting all the moments in between that you never get to see. I'm going to be spending as much time talking, laughing, learning, and hugging as I'm shooting. You are creating a visual diary for you and your children. So often you are so overwhelmed with juggling work, school, and extra curricular activities that you often cannot see what makes your family unique. 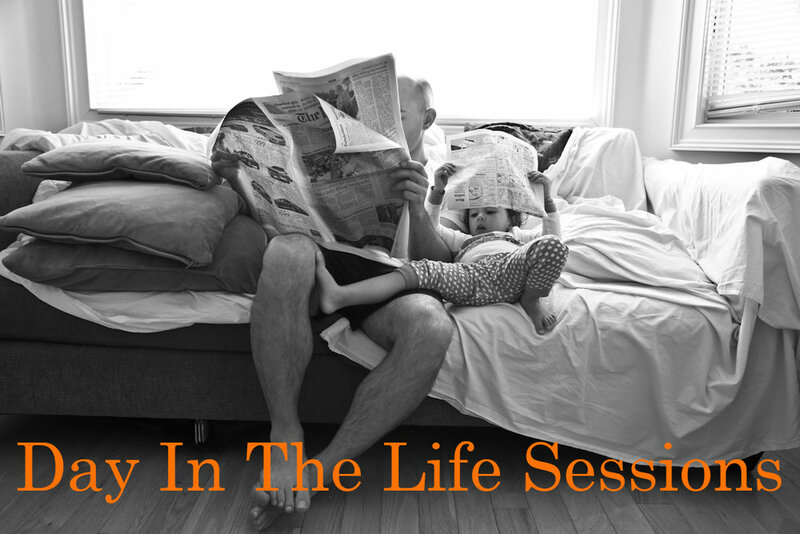 These sessions are meant to isolate a single day in your life the way it is at that exact moment. For you, the parents, it's a visual testament of how hard you work at being a taxi driver, managing tantrums, cooking dinner one handed, and breaking up WWE matches. But ultimately, these images are for your children as adults to look back upon to a day when the most important thing was who got to lick the frosting out of the bowl first. Do it now. Don't wait until...(fill in the blank). This time in your life is so fleeting, and you never get that time back again. The younger your children are, the faster they are changing and growing. When your children look back at these images 20 years from now, they will not care that you didn't lose those last few postpartum pounds, or that their home looked a mess that day. Instead, they'll marvel at the details and you'll never regret investing in the preservation of the different stages of your children's lives. The fine print: Being that these are portfolio building sessions, understand that I will be using images from your session in my website, blog and social media to promote my business. Once I go full price, I will also offer a pricing option for non-disclosure. So contact me to book your session today! Until then, keep your head up, take a deep breath, and enjoy the ride!